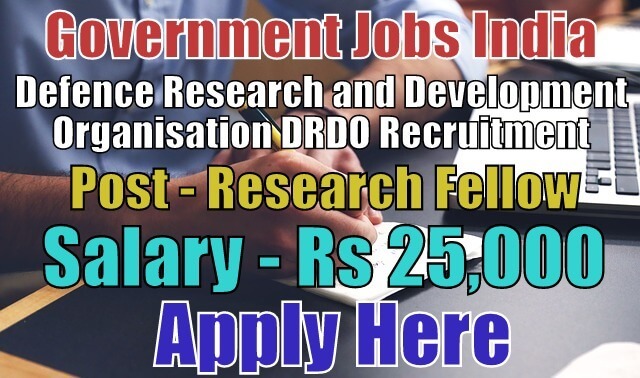 Defence Research and Development Organisation DRDO Recruitment 2019-20 (Ministry of Defence, Government Jobs in India) notification for 05 junior research fellow posts. All legible and interested candidates have to attend walk-in-interview on (03-05-2019) at 09:00 am. 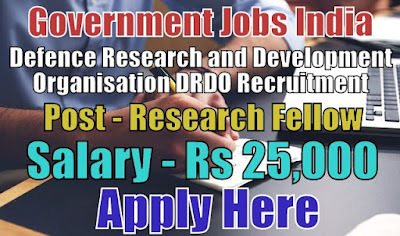 Further information about Defence Research and Development Organisation recruitment entrance exam 2019, vacancies, salary details, DRDO jobs and careers, application fee, DRDO government jobs educational qualifications and all other details/information about this post is mentioned in details below. 1. Junior Research Fellow - 05. Educational Qualifications - Candidates have done 10th (matriculation), 12th, B.E/B.Tech in mechanical /electronics and communication engineering, M.E/M.tech in computer science/ IT with NET/GATE qualification or its equivalent/relevant/higher qualification from a recognized board or university. To know more about educational qualification details, see the advertisement. If you are not graduated then, click here for 10th and 12th based jobs. Candidates have to download the application form and have to fill their bio-data. Candidates need to paste a passport size photograph on application form. After filling all the details, candidates have to carry this form during interview at the given desired address. Last Date for Submitting Application Form - All candidates must attend walk-in-interview on (03-05-2019) at 09:00 am. The interview date may extend to another day if the number of candidates were more.